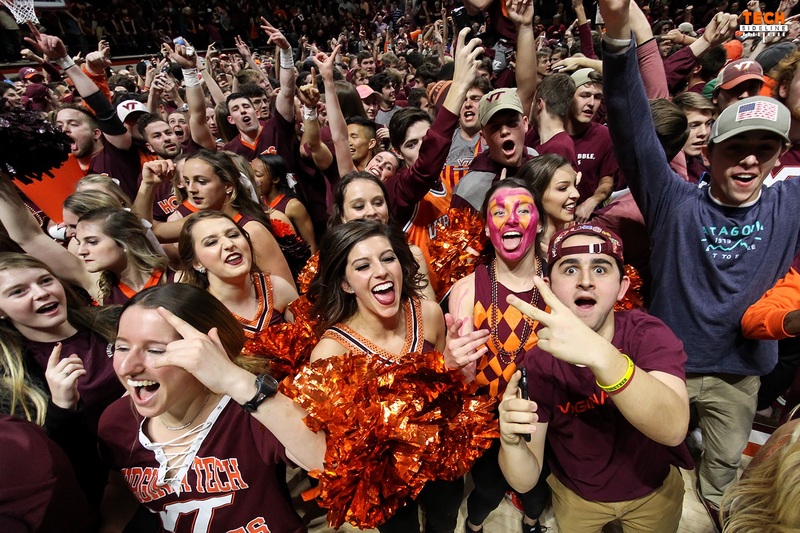 For the second time this season, Virginia Tech rebounded from a tough Saturday loss at home to defeat one of the nation’s top teams on ESPN’s Big Monday. This time the victim was No. 5 Duke, who fell to the Hokies 64-63. Tech improved to 21-9 overall and 10-7 in the ACC with the win, and they’ve all but punched their ticket to the 2018 NCAA Tournament. The Blue Devils dropped to 24-6 and 12-5 in conference play. This game was much more dramatic than the Big Monday win over North Carolina, which was dominated by the Hokies in most phases. Against the Blue Devils, Tech led for just one minute out of 40 minutes. 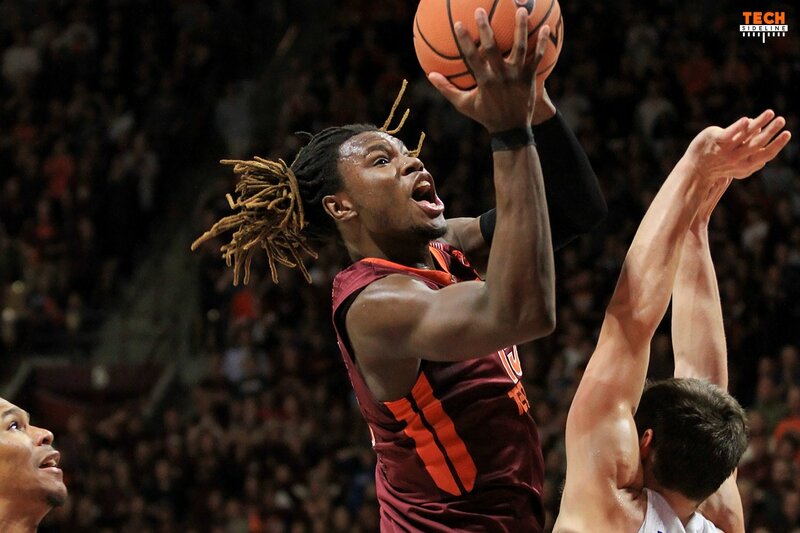 Chris Clarke put in the game-winner off of an offensive rebound with just over four seconds remaining, and Grayson Allen’s three-pointer at the buzzer was off. Clarke scored Virginia Tech’s final six points of the game as the Hokies defeated Duke for the second time in as many seasons in Cassell Coliseum. Justin Robinson was asked about Virginia Tech’s forthcoming NCAA Tournament bid, but he deflected the question to praise Tech seniors Devin Wilson and Justin Bibbs. There were two key stretches that were the difference in the game for the Hokies. Virginia Tech played great defense down the stretch in the first half to work their way back into the game. Duke only scored four points for the remainder of the half following a Marvin Bagley III dunk with exactly nine minutes remaining. At that point it was 29-14, but by halftime the Hokies had worked it to a manageable 33-27 Blue Devil lead. Tech also ended the game strong defensively. Duke’s last field goal of the game came on a Bagley layup with 7:02 remaining. They could manage just five free throws for the remainder of the contest, as the Hokies turned a nine-point deficit at the 7:02 mark into a one-point victory. 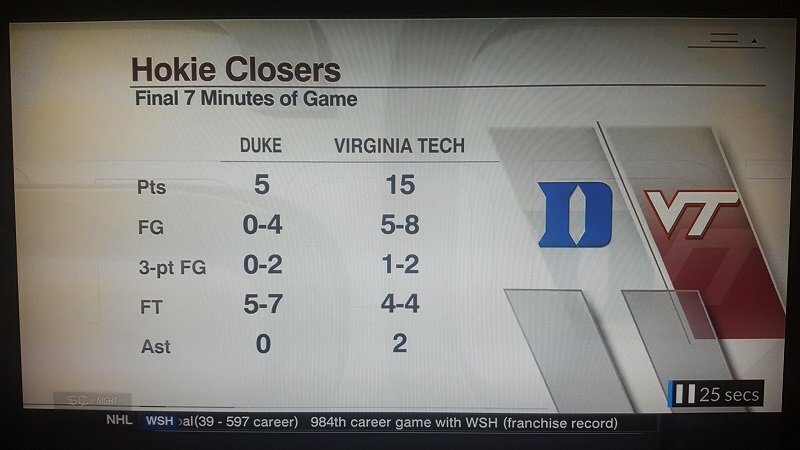 This picture from SportsCenter that was captured by Will Stewart illustrates Tech’s dominance down the stretch in the second half. Once again, it was Tech’s ability to force the opposing offense to settle for long jumpers that was the difference in the game. 28 of Duke’s 52 shots came from three-point range, and they made just eight of them (28.6 percent). Grayson Allen was just 6-of-18 from the field, and he had six turnovers, though he did finish with a game-high 22 points. Virginia Tech was able to keep the ball away from future lottery picks Marvin Bagley III and Wendell Carter, Jr. for most of the game. Bagley had 12 points and seven rebounds, while Carter had five points and eight rebounds. They took just 14 shots combined, as the Blue Devils were forced into a perimeter game, as most of Tech’s opponents have been recently. Virginia Tech also forced 18 Duke turnovers, and scored 24 points off of them. The Blue Devils scored just six points off of 12 Hokie turnovers. Virginia Tech freshman wing Nickeil Alexander-Walker outperformed Duke’s highly-touted freshmen on Monday night. He led the Hokies with 17 points, going 7-of-14 from the field and 3-of-8 from the outside. He also had two steals in 35 minutes. Alexander-Walker’s biggest shot might have been the one he missed. His jumper with six seconds remaining was too long, but Chris Clarke cleaned it up with the putback with just over four seconds left. He went on to note that it was the best miss of his career. Virginia Tech head coach Buzz Williams was obviously pleased with the victory. The victory was Virginia Tech’s third of the season against a top-five RPI team. Virginia currently sits No. 1 in the RPI, with North Carolina at No. 4 and Duke at No. 5. The Hokies also have a victory over No. 10 Clemson. As of now, Virginia Tech has five Quadrant One wins and four Quadrant Two wins. Their NCAA Tournament resume is very strong across the board, with the exception of non-conference strength of schedule, but even that won’t keep them out this season because of their high number of quality wins. Still, senior Justin Bibbs isn’t taking anything for granted. “I don’t want to jinx anything,” Bibbs said when asked about the NCAA Tournament after the game. The Hokies have a chance to add to their already impressive resume when they travel to Miami for the final regular season game of the season. Tipoff is scheduled for noon, and the game will be televised nationally by ESPN2. Tonight was Senior Night for the Hokies. Devin Wilson and Justin Bibbs each exited Cassell Coliseum on a winning note. The Hokies also honored senior managers Michael Reutt and Jason Swartz in the pregame ceremony. Justin Robinson scored his 1,000th career point in the game. He now has 1,008 career points. He is the second Hokie to reach 1,000 career points this week, joining Ahmed Hill, who scored his 1,000th career point on Saturday. He is one of three current Hokies with at least 1,000 career points. Justin Bibbs reached the mark last season at Boston College. The Hokies have defeated four nationally-ranked teams this season. That is the most wins for Virginia Tech against ranked teams in a single season in school history. The wins have come at No. 2 Virginia, No. 5 Duke, No. 10 North Carolina and No. 15 Clemson, the last three at home. Tech has won four-of-its-last five games against nationally-ranked teams. Tech is now 4-12 all-time against teams ranked fifth in the AP poll and have won the last two such games. Both have been against No. 5 Duke in Cassell Coliseum in the last two seasons. Tech is now 3-4 against Duke when the Blue Devils have been ranked No. 5 nationally. With the win, the Hokies are now 21-9 overall and 10-7 in the ACC. The win assures the Hokies of a winning ACC record for the third consecutive season, the first time Tech has accomplished that since joining the ACC in the 2004-05 season. Tech has also assured itself of a winning home record and a winning road record in the same season for the first time since joining the ACC. Nickeil Alexander-Walker scored 17 points. It is the 15th time this season he has scored in double figures. Justin Bibbs scored 14 points. It is his 20th game in double figures this season. With his 14 points, he now has 1,416 points. He passed Deron Washington tonight into 19th place in career points at Virginia Tech. Kerry Blackshear Jr. scored 13 points. It is his 19th game in double figures this season. Justin Robinson scored 11 points. It is his team-best 23rd game scoring in double figures this season. Tonight was the Hokies’ ninth sellout of the season and seventh in ACC play. The Hokies are now 4-0 in games decided by five-or-fewer points this season. Devin Wilson had two assists in the game and passed Dell Curry into sixth place in career assists in Virginia Tech history. He now has 408 career assists. I enjoyed Dakich calling out the pompous Duke coach (can’t spell his name) for calling two time outs to lecture the officials when he wasn’t getting his way. Quote: ” I don’t care how many wins he has”. This from a team that had only one foul called on them with ten minutes left in the game at their place. I hope Duke fears Blacksburg forever. Great game team! Seems like at some point this season, Buzz decided to emulate our Commonwealth brethren to the North-and-East and start emphasizing defensive prowness. A GREAT mid-season correction! We have beaten every team that is above us in the standings in the ACC. I think that is awesome because everyone gets a little scared when they have to play us. Go Hokies! When you think about it, this is the year that we have beaten highly ranked Virginia, North Carolina, Duke, a ranked Clemson team as well as NCSU & Notre Dame! I think if you would told anyone a year ago that we could beat all of those teams in one year, in college basketball we would be pinching ourselves. Believe it or not I think we’ve made history this year, I don’t believe any other Virginia Tech basketball team has accomplished with this team has this year. We have come along way from the days of beating then Memphis State when they were number one was considered the greatest accomplishment in school history. This season far accomplishes that. It seems crazy that we can beat Duke and UNC at home and lose to FSU, Miami and Louisville. If we can get that figured out we will be a top 15 program. It’s been a roller coaster but great to have the NCAA bid in the bag. Seth G elevated our program but never got us there twice in a row (not that we didn’t deserve it). So kudos to BW. Next up, get to the sweet 16 which we haven’t done since 1967! I have to apologize and confess! With the way we looked and started the season, I thought this year was maybe an NIT year at best and then only if we started winning some games! I was wrong so forgive me Buzz and team for doubting you! Listening to the post-game comments by our fine student athletes shows what great young men these guys are. We are blessed to be represented by these guys. I’m proud to share the banner of HOKIE NATION with them. My favorite sentence in the article? “Virginia Tech freshman wing Nickeil Alexander-Walker outperformed Duke’s highly-routed freshmen on Monday night.” Unfortunately it wasn’t a route, and I’m sure it was a typo, but I LIKE IT! Don’t go fixing this typo. How nice to beat UNC, Duke, and Notre Dame, my 3 most disliked programs, and the Wahoos too. ***Will or Chris, it would be nice to have someone explain what Buzz said to the ESPN reporter at half time. I’m thinking like the x’s and o’s you sometimes do for football plays. Really. Louisville isn’t in your top 3? Airball Putback…….. Just how we drew it up. I knew it could be No way Hokies lose back to back home games after playing flat against Cardinals. Have not seen it or had this much basketball fun since Malcom Delaney, Jeff Allen/Terrell Bell, Dorenzo Hudson, A.D Vassallo, and JT Thompson. Good bye tournament bubble..this Team is poised, constant, and HOT at the right time of the year! Don’t forget Deron Washington! He was just plain fun to watch! But but but I thought it took $100k to get the best players to beat the best teams….. Awesome Victory!! Nice to send out the Seniors with a incredible win over a top 5 program like Duke. Something they will never forget. Thanks for all you have done for the Hokie Nation Devin and Justin! A few weeks ago I thought this team was done. Wow, was I wrong! This season VT has beaten each of the top 5 teams in the ACC standings: Virginia, Duke, UNC, Clemson, and NCSU. No other ACC team can make that claim. Tech is due to due to beat a top 5 seed in the ACCT. LET’S GO! HOKIES!